PIER 22 stays open late to give cheers to the new year! Downtown Bradenton’s landmark restaurant is celebrating New Year’s Eve by the waterside with DJ entertainment, housemade menu selections, and VIP party options. 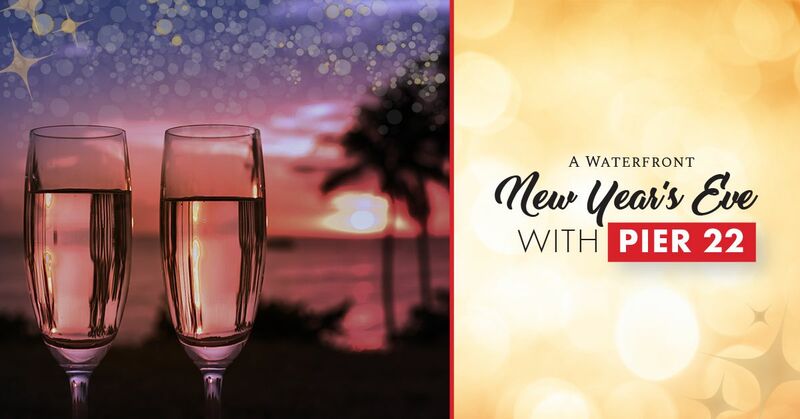 PIER 22 New Year’s Eve Hours Sunday, Dec. 31, 2017, from 11:30 a.m. until 1:00 a.m.
• Special holiday menu is served from 4 p.m. – 11 p.m.
• Seating preferences for General Dining Reservations will be assigned by the order in which they are received. We are unable to guarantee a specific table, but we will do our best to accommodate your request based on availability. • The kitchen will close promptly at 11 p.m.
• Due to the popularity of this event, a credit card is required to make a reservation. • The VIP buffet will be served from 9:00 p.m. - 11 p.m.